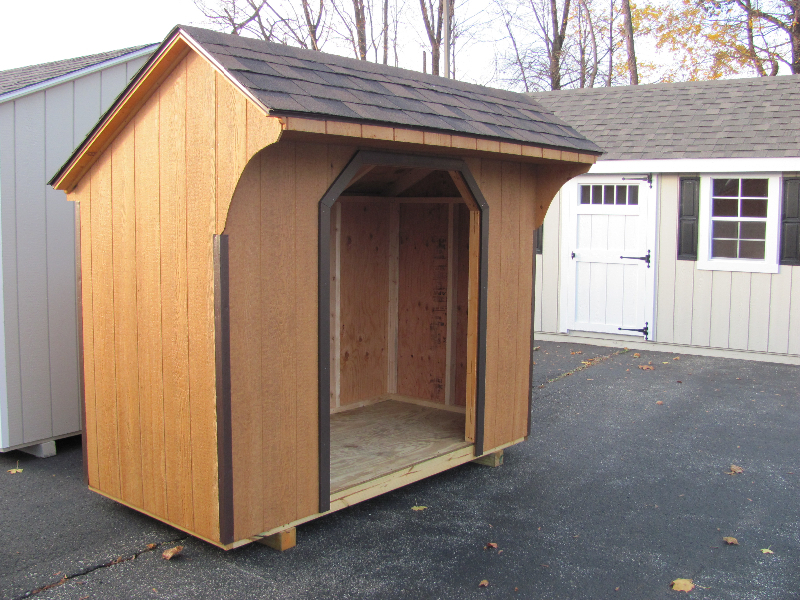 Amish Mike’s Traditional Series sheds provide a solution for all of your storage needs, including use as a firewood shed. 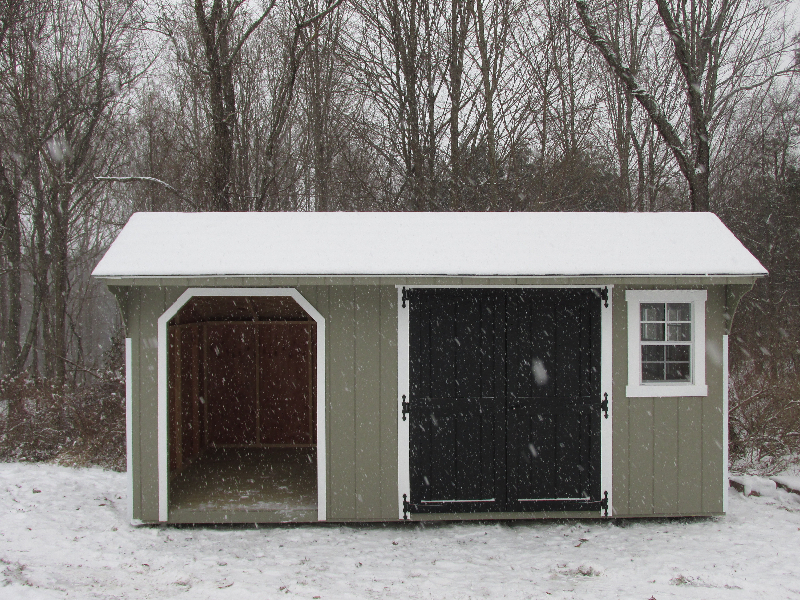 Our Traditional Series shed is the most economical choice for your shed using top grade lumber, T-1-11 siding, and our Traditional trim package and hardware. Our Traditional Series shed floors are built with pressure-treated 4×4 skids, 2×4 floor joists 16” on-center, and 5/8” exterior grade plywood. The walls and roofs are framed with grade “A” 2×4 studs and rafters 16” on-center. The roof rafters are covered with 1/2” plywood sheathing and 30-year architectural shingles. Heat shield is also available on the plywood roof sheathing. Traditional sheds have 1”x4” T-1-11 roof lines with 4” overhangs. The Traditional Series includes 3 shed lines: Premium Quality, Standard Quality, and Value Series. 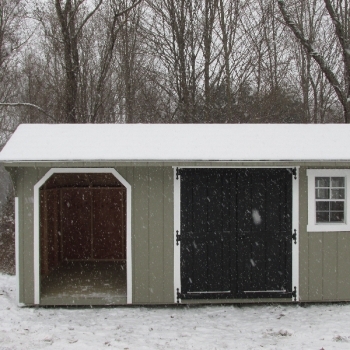 The Premium Quality shed line is built using 5/8” Dura-temp T-1-11 siding. Vinyl siding is also available in the Premium Quality series for an additional fee, which includes steel/fiberglass insulated doors, and your choice of Dutch lap or shiplap siding. 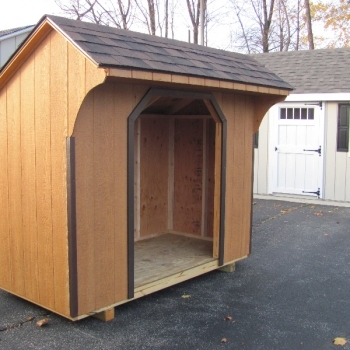 The Standard Quality shed line is built using ½” Dura-temp T-1-11 siding. Vinyl siding is not available in this line. The Value Series shed line is built using ½” T-1-11 siding and ½” orientated strand board (O.S.B.) roof sheathing. Vinyl siding is not available in this line.